First, the pusher 086ST0079. It’s a push-fit pusher for the Speedmaster Reduced. 50% of those shear at the bottom of the screw thread when you try to unscrew them. Firstly, please don’t supply them assembled, and secondly, don’t screw them together like there is no tomorrow. The screw will break. At £35 a pop, an expensive pleasure. So changing one costs you an average of £70, as one out of two break. 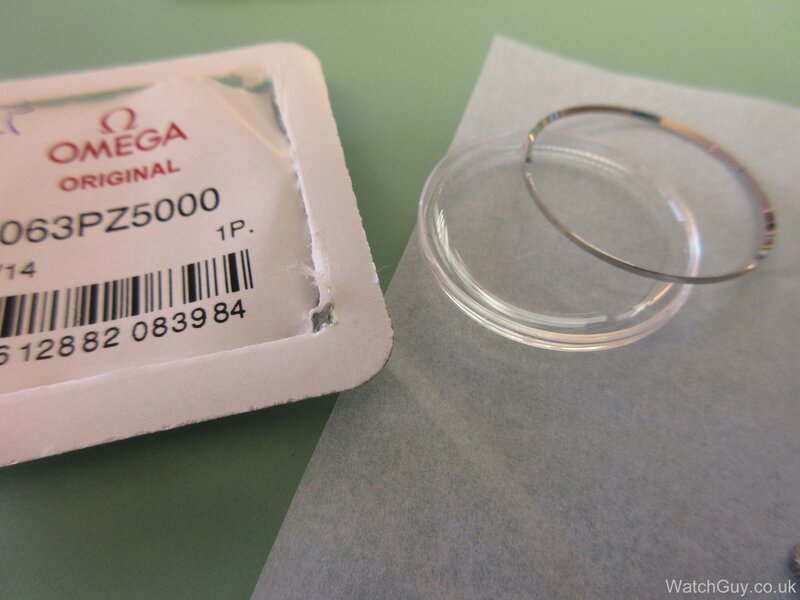 Next in line, some crystals for older Omega watches. Here we have an 063PZ5000. You press it into the case, and it just breaks. The cheap Sternkreuz tension ring for £4 (the Omega one costs £33) fits like a glove, every single time. The Omega ones break, every other time. This one broke nicely around the side of the rim. Good that Sternkreuz can make generic crystals that are of decent quality, and that fit. Next on the list of grievances – hands. Omega can’t supply hands that just fit. They always have to be broached. Same for the 550 rotor bushes. They also have to be broached to fit. This entry was posted in Swiss, Uncategorized by Christian. Bookmark the permalink. I’m looking for part 1128 31.047.06 can you help? Another Omega crystal broke while fitting it in the case.. Drives me a little nuts.. Now fitting a generic crystal as I can not afford loosing money like that. raise (a difficult subject) for discussion. pierce (a cask) to draw out liquid. And there is of course the verb to go along with that. So if I say that I have to broach hands and rotor bushes, I refer to the action of widening the hole with a broach. Anyhow, I didn’t know we had a blog for grammatical discussions here. I’m a craftsman. 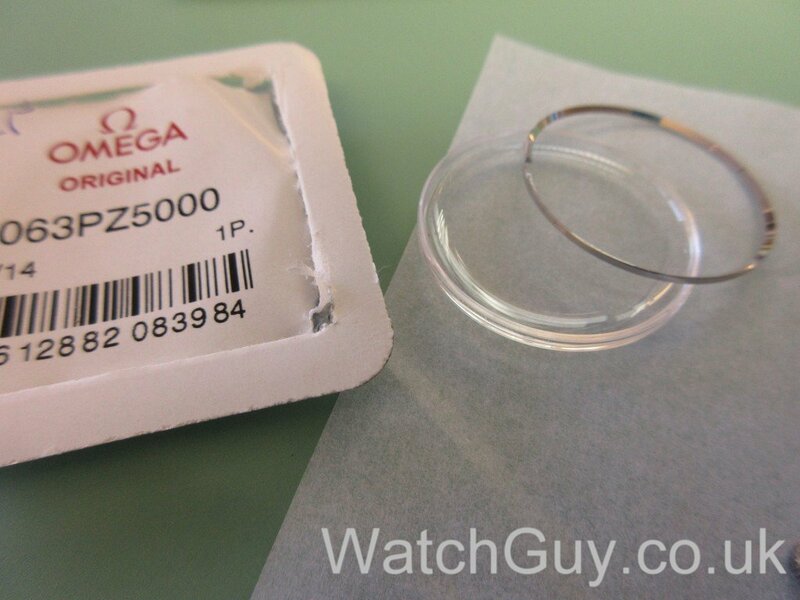 I have an Omega 176.014 “TV Dial” when I bought it, the crystal needed replacing. The Independent watchmaker purchased an original replacement and installed it into the watch. To my amazement the second and minute hand did not line up with the painted tachymetre on the crystal. As the crystal is square it can only fit one way. In the end the watchmaker had to trim the crystal. I googled my watch and saw several images where the second and minute hand did not line up with the tachymetre. My point? From my experience Omega parts certainly have quality issues. Ya. Omega seems to be more money minded nowadays. Still they arent compromising on their prices even though they produce 1.2 Million watches/year. And when you see Zenith still comes standalone in picking up products and just produce 40k Watches/ year . Hi, Christian. I have a question, you say it just break, do you mean the crystal or the tension ring? is the tension ring suppose to have a cut out, or is it ha solid hole ring? I can see on my watch that the tension ring have a break. The crystal. It breaks. Tension rings don’t break – they all have a split. Christian, about the crystals for older Omega watches. you may have answered your own question, old stock genuine crystals could suffer from environmental issues such as UV, temperature and humidity during storage over many years, causing them to become brittle. The generic equivalent may not be on the shelf as long. 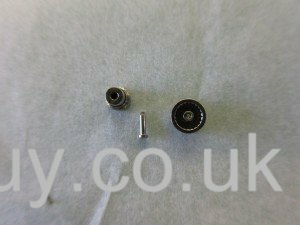 As for the Omega 550 rotor bushes, there is some information on http://www.omegaforums.net as to why they need to be broached to fit, check Archer and Ketiljo posts. Keep up the good work. Right … the packaging of the crystals that break doesn’t look old at all, but fairly new. They just don’t fit. I’m familiar with the reasoning on the Omega bushes. Let’s put it that way – other manufacturers make parts that fit. You put them into the movement, and that’s it. If my rotor post is worn, I want to replace it, and have a bush that fits perfectly over the new post. Broaching isn’t great, as it doesn’t create a straight hole, so it’s pretty bad, even if I go in from both sides. You can always find excuses, but it’s better to compare what you get from Omega with what you get from other manufacturers. And in that comparison, Omega fails. It seems to me Omega is intent on making their own repair operation as profitable as possible and see independent repairers as unwanted competitors (who apparently can often do the work as well or better for a lower price). The next step would be to make parts that cannot be duplicated by generic manufacturers, at least not easily, or that require special proprietary tools to service. If this is their strategy, I think it is utter folly, but time will tell. Before I go on I would like to say I read every post and more often than not enjoy every bit (despite me knowing very little about watch mechanics). However, it’s not very professional to slag off companies – the tone of your output now seems to reflect a bitterness regarding your rejection by SWC/Omega Service Dept. Would your attitude be this way if you were a registered Omega service centre? It’s a little sad to see as this blog wasn’t always snobbish or brand-bashing. I would prefer to focus on watches and their mechanical and stylistic intrigue. Alas, it is your website. 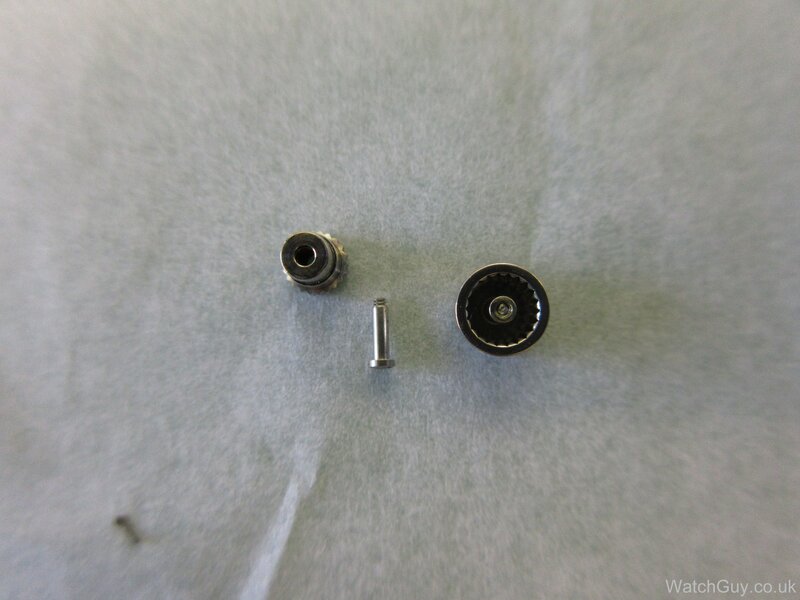 I think it’s ok to speak out if the quality of parts isn’t as it should be. There is nothing sacred when it comes to watch manufacturers, and the more people point out things like that, the more they will try to do a better job. Surely you will point out if something you buy is of inferior quality? Of course, if I had a parts account, I wouldn’t be able to say things like that for fear of losing the account. Not really a good argument why I shouldn’t speak out. You would happily supply bad quality parts and keep quiet about it just because you had the recourses and approval from Omega to do so? Hmm.. we are getting into trolling territory here. I never said such a thing. Posing questions and discussing a subject is not trolling. I’ll say no more. Who do you work for Graham? I am merely a watch enthusiast who owns four watches – one of which being a Swatch – so that is the closest I could come to being any sort of Omega affiliate. Not very professional to slag off companies….? Sounds like dictatorship to me. Would you see it as OK for Omega to publish a negative opinion of watchguy.co.uk’s work to the world? I think waiting until you have been cut out of a group before you publish negative posts about their parts is just not cricket. And it is just my opinion. Christian, even without being a customer I like you because you say things as they are. Oh yes they put loctite the strong white one. Use a heat gun first. maybe the swiss watch companies plan would back fire and they would have to supply us independent watchmakers with authentic parts if we start a campaign to use generic parts. Their mark up on these parts must be enormous. 1000%?